The Simpsons Series 2.0 mystery bags featuring 16 unique minifigures with accessories to trade and collect! 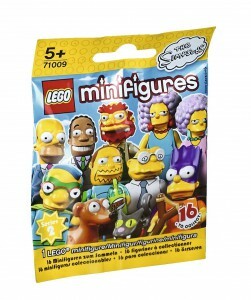 Collect every minifigure in The Simpsons Series 2.0! Ay carumba - it's a brilliant second LEGO Minifigures series for The Simpsons! This cool collection features 16 of your favorite characters from the iconic animated TV show. There's Homer in his best suit and tie, Marge in a fancy dress, Bart as Batman, Lisa with Snowball II, Milhouse as Fallout Boy, plus Maggie with Santa's Little Helper, Smithers, Patty, Selma, Comic Book Guy, Groundskeeper Willie, Edna Krabappel, Dr. Hibbert, Professor Frink, Hans Moleman and Martin Prince. Each minifigure comes in a sealed 'mystery' bag with one or more special accessories, display plate and collector's leaflet. Open up a bag and see who you've got! Unfortunately, we cannot accommodate requests for specific minifigures - and some minifigures may be more difficult to find than others.